Having trouble thinking like Pythagoras, figuring out what E = MC2 means, or reading a Shakespeare play? The links below provide flashcards, quizzes, and fun ways of learning your school subjects! Sponsored by Scholastic, Homework Hub is for students K-12 and has everything from references to quizzes, to a helpful flashcard maker for studying. 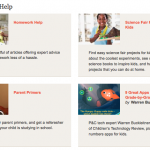 The Discovery Education site offers free student resources for students K-12 that includes homework help, interactive games and activities, as well as step-by-step WebMATH. 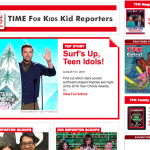 As part of the TIME for Kids website, this homework helper site is geared towards K-12 students with links to sites relating to science, math, social studies, etc. 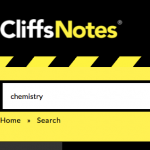 Did you know that Cliff Notes offers articles on a variety of STEM subjects from Calculus to Chemistry, Physics and Statistics? Khan Academy offers almost 4,000 short lessons in the form of free online videos. The impressive video library contains courses in math, science, computer science, finance & economics, humanities and test prep. The website also features sets of questions that allow students to practice necessary skills like mastering the order of operations. Students can even track their progress and see which lessons and goals they have accomplished.